ATLANTA - It’s the last one that’s the rub. The final game of the series, the inability to close out a sweep. Not that the Red Sox are getting that greedy, mind you. They’ll take the series wins, which they’ve gotten in each of their last six tries. But it’s that final game, after winning the first two, that they’ve lost in four of their last five series. And yesterday it happened again. As the Sox bid adieu to interleague play - telling David Ortiz to pack up that first baseman’s glove until a possible postseason reappearance - they couldn’t close out the final game in the final National League series. Not that they’re disappointed, even with a 2-1 loss to the Braves before 41,463 at Turner Field leading to an 11-7 record against the NL this season. They didn’t yesterday, even as the Sox allowed just three runs to the Braves in the three games against them. Of course, the Sox didn’t score a whole lot more, with just six runs of their own. With the offense shut down for six innings by ailing Atlanta starter Tommy Hanson (flu-like symptoms), and the Braves striking back with a pair of solo home runs on yet another heat-scorched day, the Sox threatened late but simply didn’t have enough. Meanwhile, Brad Penny was doing his best to shut down the Braves, allowing just a first-inning home run to Chipper Jones off a breaking ball and a fourth-inning homer to Garret Anderson on a fastball. Though he struggled with his curveball, Penny gave the Sox six solid innings and continued a stretch in which he’s allowed just five earned runs in his last four starts. But he couldn’t make up for the lack of offense, though Penny did get on base in the fifth inning when Jones committed an error at third, making him the second Sox pitcher to reach in two games. While Hanson was on the mound, the Sox got just two hits and two walks, and threatened only in the fourth when Hanson loaded the bases on singles by Jason Bay and Ortiz and a walk to Jason Varitek. But Jacoby Ellsbury ended the inning by grounding to second base. With one out in the seventh, Varitek grounded a double to short right field past second baseman Kelly Johnson, turning a ball that barely went far enough for a single into two bases with an impressive base running display. Johnson then made an error on a ball hit by Ellsbury, which sent Varitek to third. But Johnson got his revenge, picking up a Nick Green grounder at the second base bag to start the double play that ended the inning. Though the Sox went 1-2-3 in the eighth, they had another chance in the ninth against Mike Gonzalez. Youkilis singled to left, and Bay fanned. Ortiz grounded to second and Youkilis got caught in a rundown, but he made it back to first base for one of the very few 4-3 outs with the runner on first not advancing. Youkilis made it to second on defensive indifference, and Varitek took advantage, singling to center to drive Youkilis home. But Ellsbury struck out swinging to end the game, the series, and interleague play. “We couldn’t mount anything,’’ manager Terry Francona said. “We got the one real good chance; Green hits into a double play. Even with the chances at the end, and inducing an 0-for-10 with runners in scoring position for the Braves, the Sox couldn’t sweep the series. 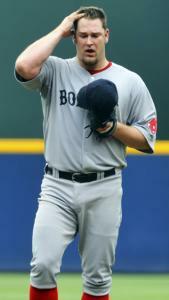 “We’ve got a lot of fight in our team,’’ Youkilis said. “We’re going to battle it out till the last out. You’re not fighting time, you’re fighting the last out. We’re going to scrap away, and do what we’ve got to do.